Every adventure gamer or gamer that played games in the 80s and 90s, would've heard of the King's Quest series and with good reason; without the series, Sierra wouldn't have become as prominent as it did and the King's Quest games pioneered many concepts with respect to graphic adventure games. The first King's Quest was released in 1984 for IBM PCjr but was ported to several platforms over the subsequent years. King's Quest was developed using an in-house engine called the Adventure Game Interpreter (AGI); it was responsible for bringing adventure games into a new era of coloured animations, music and sound effects. In terms of the story's plot, you play the role of a knight called Sir Graham who is tasked by the king to recover missing artifacts in order to restore the kingdom to its former glory: if you succeed in this task, you are crowned the new king. King's Quest was followed up with a sequel only a year later: King's Quest II which also used AGI. Just like King's Quest I, it too was ported to several platforms over the subsequent years. The game continues the adventures of Graham (who is now King of Daventry) as he searches for a wife and ends up rescuing a damsel in distress called Valanice. In 1986, King's Quest III was released. Most of the same people were involved in the game's development as the previous King's Quest games but Al Lowe (famous for his Leisure Suit Larry series) as well as his wife, Margaret, were also brought aboard to program the game and provide the soundtrack respectively. Annette Childs provides a short prologue story in the game's manual. King's Quest III was the first King's Quest game to feature EGA and Hercules graphics support and would be re-released a year later on the improved AGI V3 engine. The game apparently sold 250,000 copies (according to a "Computer Gaming World" article in 1993) although when the same magazine reviewed the game, it was described as exceedingly frustrating and that a hint guide was highly recommended. In King's Quest III, you play the role of a 17 year-old boy named Gwydion who is a slave to an evil wizard called Manannan. The game did attract some initial backlash from fans of the series since it didn't feature King Graham or the kingdom of Daventry, nor did it seem to be connected in anyway (although it only becomes apparent that there actually is a link once you progress far enough in the story). As I played quite a few Sierra adventure games back in the day (including King's Quest V and King's Quest VI) it only made sense for me to acquire the entire King's Quest collection when it became available on GOG. At one point, I wanted to discover the older games in the series because I was playing the 2015 King's Quest game by the Odd Gentlemen (the game revolves around King Graham's life after all) although I eventually discovered that King's Quest I and King's Quest II weren't very enjoyable and I eventually gave up making any more progress with the series. 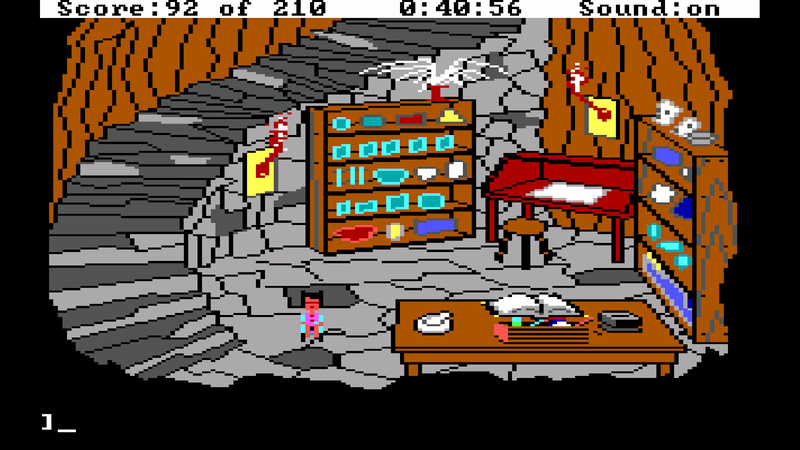 As part of my Pile of Shame initiative, however, Choona wanted me to revisit all the Sierra adventure games that I haven't reviewed on this blog, so it made sense to continue exploring the King's Quest series, which meant resuming where I left off and that meant King's Quest III was next. As was the case with previous King's Quest games that I've reviewed, King's Quest III is definitely another game that deserves its place in PC gaming history: it's one of Al Lowe's first big gigs at Sierra (who would go on to produce the Leisure Suit Larry series) and it's the first King's Quest to include 16-colour Enhanced Graphics Adapter (EGA) graphics! The game also featured a more advanced version of the Adventure Game Interpreter (AGI), an engine Sierra primarily used in the 1980s. It's probably not a good sign when you're struggling to find something nice to say about the game when one of the best aspects is how they've implemented copyright protection, but hey, I actually dig it. In King's Quest III you'll need to cast quite a few spells and in order to do so, you'll need to follow instructions to the letter from a spell book, and that spell book happens to be, you guessed it, in the game's manual. A lot of games require you to wait before you have to perform certain actions, but usually it's a matter of seconds and not tens of minutes. I've played games that have done this before but they usually use it as a mechanic to help immerse the player (e.g. baking a cake in Hate Plus). However, waiting in King's Quest III is tedious. At one point in the game you have to wait for some pirates to yell out that they're about to drop the anchor. It seemed like an eternity waiting for this to occur that I was alt+tabbing out of the game in order to do something more productive with my time. I ended up restoring the game from further back thinking surely, I missed something, that somehow, I had inadvertently reached a dead end as nothing seemed to be happening: turns out I was wrong, the game really does take a long time for actions to occur. In the end, I waited for one hour before the pirates said they were dropping the anchor, although I was admittedly alt+tabbing out of the game quite frequently. There were two times in this game where I'm pretty sure I never would have got past without hints or a walkthrough. Let us start with the first example: acquiring snake skin in the desert. Now, apparently, while walking through one of the many screens in the desert, you're meant to pick up some snake skin. Thankfully, the walkthrough I ended up using to complete this game specifies the exact location to acquire it, but all you can see when you arrive at the correct screen is a few brown pixels on the ground. Now, usually in oldschool adventure games, typing the command "look" into the text parser will reveal anything that is of interest on the screen; this is not the case for this particular puzzle as the game doesn't mention the snake skin on the ground at all. This is in contrast to another screen where you come across a cactus you need to collect which is growing next to a large rock. Typing "look" on this screen will let you know that the cactus looks peculiar or unusual, which is adventure gamer speak for "put me into your inventory!" A bit of inconsistency here Sierra! Our second example involves trying to find a key that is hidden on top of a cabinet in the evil wizard's bedroom. What is so infuriating about this is that there's no way to tell the key is on the cabinet by employing the "look" command in the room. There's also no way of seeing the key on the screen; the game's resolution is too low for that but then there's also nothing that sparkles on the screen to bring your attention to it. In the end, the only way to discover the key is to type "look on top of cabinet". Seriously Sierra, are you guys sadists? How on Earth are you supposed to know it was on top of the cabinet? Are you meant to go around the entire game looking on top of things just in case something is stashed up there? Or maybe you're meant to look under every item too? Or maybe to the left and to the right? It's hard enough to know what actual items you see on the screen thanks to the primitive graphics (e.g. is there a giant bell or sombrero hanging from the kitchen roof?). I can now almost believe the rumours that Sierra purposefully made the puzzles almost impossible to solve in order to boost the number of calls to their (paid) hint lines. Like previous King's Quest games, King's Quest III sometimes relies on random encounters or chance for its puzzles. For example, there is one part of the game where you're meant to infiltrate a bandit's tree hideout. Now when I tried this the first time, the bandit was waiting to push me out of the tree and to my doom. Adventure gaming logic would usually tell you that in this scenario, there's no point going back and repeating the same steps again since it should again lead to your death. At the very least, you would need to acquire some inventory item or trigger some event in order to deal with the bandit. Nope, not the case with King's Quest III. The actual solution to the puzzle? Save scum your way to a point where the bandit actually falls asleep and then climb into the tree hideout. I rarely see that sort of stuff in contemporary adventure games and I'm kind of glad I don't. Yep. If waiting for ages for things to happen, missing items you didn't even know existed or missing out on the right random encounters doesn't infuriate you, don't worry, there are also several opportunities for your character to fall to his death, thanks to narrow walkways. The only saving grace with respect to these "puzzles" is that at least I knew how to solve them, but it does require some dexterity in order to traverse safely from one place to another (or just lots of save scumming). Like the first two King's Quest games, King's Quest III was probably a fantastic title back in the late 80s but I seriously can't see anybody nowadays enjoying this title unless they played the game when it was originally released and already know the solution. If I had to say something positive about the game though, at least the plot is better developed than the first two games in the series and the casting of spells was pretty neat too. (I've placed the following disclaimer when reviewing Sierra games before and I'll say it again: before I get burned at the stake by the Sierra fans, I'm trying to judge this game on its own merits, playing it today in 2019. No doubt the game was highly regarded by fans in the 1980s, but nowadays, things have evolved and, in my humble opinion, generally for the better). Is the game worth $14.09 AUD? : No. Although it really depends if you're an old fan (so you've probably already got a copy anyway) and what price you would put on retro games in general. The $14.09 gets you King's Quest 1, 2 and 3 though.